The kids often pull you in opposite directions, especially when there's only one adult capable of keeping up with them. But there is a healthy way to settle sibling disputes: bumper cars. That's a situation where kids are allowed to hit each other, repeatedly. 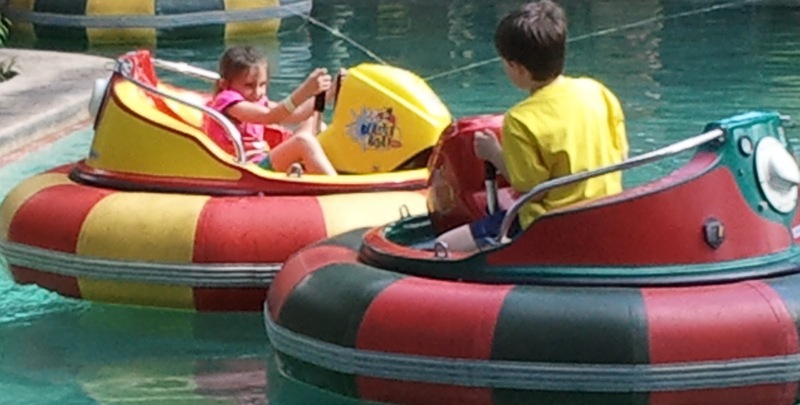 Bumper boats also work. The Magical Midway was a refreshing change from the Mickey Mouse pop culture of Orlando. It was more reminiscent of an Atlantic City Boardwalk type of amusement park. There are two outstanding wooden, multi-level Go-Kart tracks - the best I've ever ridden on. In addition there were the bumper cars and boats, the StarFlyer, trampolines, plenty of video games, and what they tout as the world's largest Sling Shot. I don't know who the governing body is that verifies that, but I'll take their word for it. It was an extra $50 so neither the kids or I took the flier. There was an unrelated family trip to the ER, but that's a story for another post. 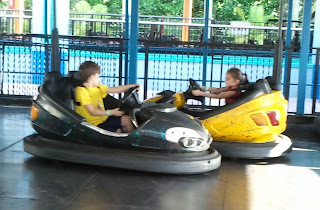 But it involved us getting a late start for Busch Gardens in Tampa on Day 4. There were some rides there that made the Sling Shot look fairly tame by comparison. 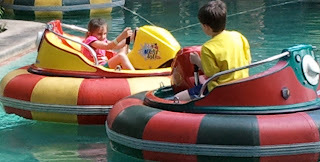 Fortunately, despite the kids' enthusiasm, they weren't tall enough to ride them. So we opted to get soaked instead on the Stanley Falls Flume and the Big Congo Rapids rides. The weather cooperated. It wasn't too hot to enjoy the day and it was overcast enough to scare off the huge droves of Springbreakers.